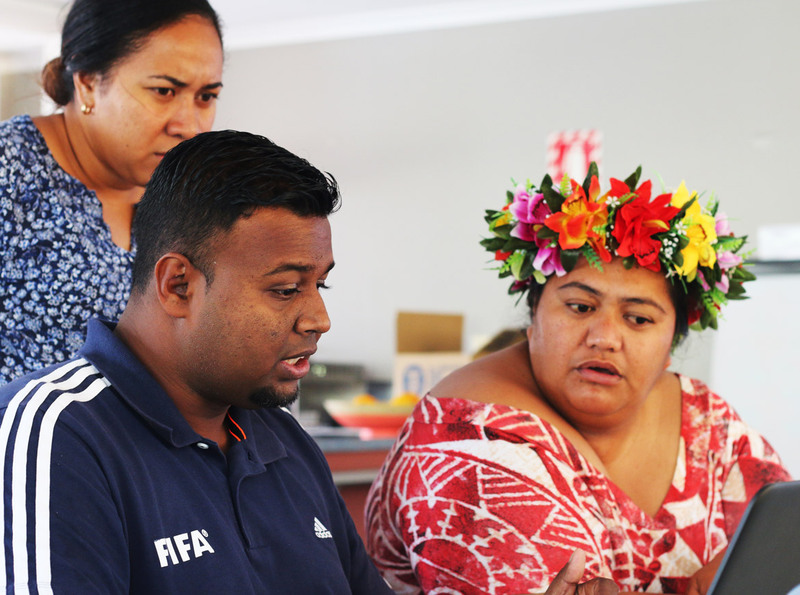 Fiji FA competitions manager Amitesh Pal (L) shares his COMET knowledge with colleagues Pauline Dean (R) of Cook Islands Football Association and Penateti Feki from Tonga FA. A recent COMET Cluster Workshop held in Auckland, New Zealand is expected to professionalise football clubs across the Oceania and align them more closely with the Oceania Football Confederation. OFC Competitions Director Chris Kemp said the competition management programme run by Croatia-based Analyticom, in place at OFC for more than 12 months, is an opportunity to bring the Confederation and its Member Associations together from a competition perspective. “It’s a system which is easy to operate and will help competition managers across the region to do perform their roles,” he explained. Kemp said having a region-wide database is an important step especially with the fluidity with which players swap clubs domestically as well as within Oceania. “When players are in teams in our regional competitions, for example the OFC Champions League, but are also playing in their national teams, age-group competitions and senior competitions, it makes the process a whole lot easier as we’re not manually entering data every time. “It’s all coming through in a consistent format, and then of course we can also create accurate statistics on all the players and coaches. “The system is great in that it can deal with everybody from a grassroots player through to someone playing in the OFC Champions League. Having been an avid user of the previous competition management system used by the Confederation, Fiji Football Association were early converters to COMET and competition manager Amitesh Pal said it has changed the way he and his team now operate. “So far we have executed 18 competitions in Fiji and it has been, as the name suggests, a competition management expert system,” Pal explained. “We have managed to do everything professionally and it has saved us time. Pal said the system hasn’t only benefited the competition department, but other departments in the MA as well. “As an expert system it covers all facets of football which involves all the stakeholders like the media department for example. Cook Islands Football Association competition manager Pauline Dean has used the system while serving as a match coordinator during the OFC U-16 Women’s Championship in Samoa and said straight away she could see the benefit it will have at home, and across the region. “From a CIFA point-of-view, and from my personal experience, it’s been really easy compared with what we were using before with the registration of players, the creating of teams and any other features we require it’s been adaptable to our own situation,” she said. Like Pal, Dean believes one of the positive outcomes is the time it will save her as she manages all the domestic competitions in Cook Islands. “Previously it would take me almost seven days a week just to register all the players, create the competition, add results and so on. With this new system that time is reduced and the responsibility for inputting the information is shared across the referees and the clubs, as well as the competition manager. Although the COMET Cluster Workshop was introducing a lot of information in just three short days, Kemp was positive about the reception from the participants. “It’s a step up for them but they’ve all embraced it really well and you can see them thinking through how they are doing things now, and how it relates to say a team from the villages in Cook Islands, through to the clubs in Fiji, New Caledonia and New Zealand. Having invested a lot into the introduction of a system that will work for everyone in Oceania, Kemp said having key performance indicators is important. “I think one of the KPIs for us is the members telling us that it’s easier for them to do their job,” he said. “For us, we are going to get stats on the referees on their performances, we’re going to get stats on the players.